Fillers are usually priced per syringe injected. The cost will depend on how much material is required. Most people don't need more than one to two syringes. Total costs range between $500 and $2,000. Most health insurance plans won't cover cosmetic surgery or complications associated with cosmetic surgery. Before undergoing the procedure, make sure you understand all the charges and ask if your doctor offers a payment plan. The most important thing is to find a doctor who is qualified and experienced in giving injections and one whom you trust. Don't go to just anyone. 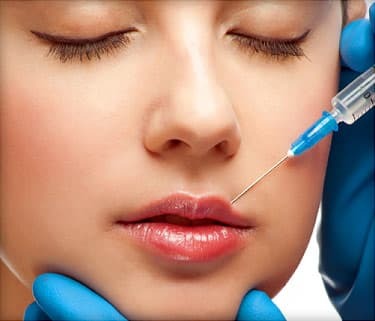 Lip augmentation poses real risks, especially if the person giving the injection is inexperienced. Do your homework. When making a decision about which doctor to use, ask about the doctor's training and education. How many injections has he or she given? Is he or she board certified or a member of their specialty's medical association? Also, ask to see before-and-after photographs of patients the doctor has treated. Are you happy with the results? If you aren't, consider getting a second opinion. American Society for Aesthetic Plastic Surgery: "Lip Augmentation." American Society of Plastic Surgeons and American Society for Aesthetic Plastic Surgery: "Injectable Fillers." Premier Image Cosmetic and Laser Surgery: "Procedures: Face" and "Facial Fillers and Injectables." The Cleveland Clinic: "Treatment and Procedures: Lip Augmentation." American Society of Plastic Surgeons: "Dermal Fillers: Hyaluronic Acid." Alan Gold, MD, board-certified plastic surgeon, Great Neck, N.Y.; member, American Society of Plastic; past president, American Society for Aesthetic Plastic Surgery.